I grew up in the Midwest and began my adult working life in Corporate America, primarily in sales and marketing… After many years of serving large broadcast organizations, such as ABC and CBS, in the areas of Business Development and Promotions, I returned my life’s focus to my love of animals. I have been working closely with animals for the past 15 years. I started working with animals by volunteering at Much Love Animal Rescue in Los Angeles. Through Much Love, I became a failed foster twice and now have two amazing formerly feral cats, named Monster and Siddhi. It was because of these two cats that I really started paying attention to the effects their emotions had on their health and well being. 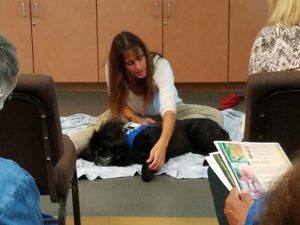 Stress causes a lot of health issues in animals, especially rescues. So I learned that it is very important to make sure they are happy, relaxed and fed a very healthy diet to boost their immune system. Through this process I really learned a lot about nutrition for domestic animals and am a true believer in raw foods or at least human grade equivalent foods with no by-products. 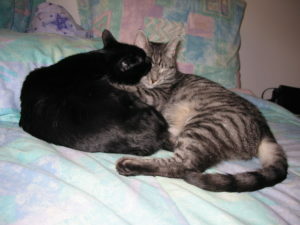 Both Monster and Siddhi are currently thriving on raw food and doing very well. Siddhi had a hernia when she was born that was operated on, but the initial operation didn’t hold. After her second surgery, she was not doing well and Western Medicine was not helping, so I found a holistic vet, Dr. Monica Laflin, who alleviated most of her symptoms after one treatment. You could tell immediately that Siddhi was so much happier and finally pain free. I asked Dr. Monica what she did to help Siddhi so quickly and assuredly. The doctor informed me that she had used a combination of chiropractic, acupuncture, homeopathy and Reiki. Having never heard of Reiki, I quickly bought a book on the subject and started reading. I was hooked. Soon thereafter, I found Dr. Carol Wilson online and really liked her background so I took my first Reiki class in April of 2007. I have been practicing on people, pets and plants ever since. My current employment at an animal center allows me to work with animals on a daily basis. I became a Reiki Master/Teacher in January of 2008 and have been practicing professionally since. I have also added other modalities such as reflexology, essential oils, acupressure, crystals and tuning forks to my practice as Reiki really does work in conjunction with all forms of healing. However, Reiki will always be the primary method of treatment, as it has an intrinsic ability to work for all creatures and create the perfect healing result for each moment. I have recently begun working with cancer patients at Sharp Memorial Hospital. This is tied into a program that is scientifically documenting the effects Reiki has on Cancer patients and patients in the Intensive Care Units. I am excited to be part of this research and honored to work with these amazingly brave and incredible people. I have committed to this for one year and will keep you updated on what I learn. Nedra has worked in animal rescue for the past 18 years. She became a Reiki Master in 2008 and started her journey towards becoming a small animal acupressure practitioner in April of 2010. She is Nationally Certified in Small Animal Acupressure, Equine Acupressure and Small Animal Massage through NBCAAM. National Board of Certification for Animal Acupressure and Massage. She believes Traditional Chinese Medicine (TCM) is a lifelong practice and is looking forward to the journey. 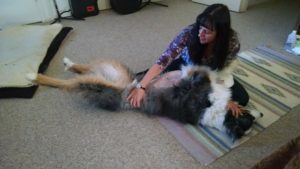 Nedra is a Reiki Master and Nationally Certified Small Animal and Equine Acupressure Practitioner. Nedra works with all types of creatures. Dogs, Cats, Horses, Exotics, and Humans.